Recently volunteers Jenn MacArthur and Karin Laskowski and her dog Piper did a presentation for about 14 girl scouts and their leaders. Jenn presented the information about who we are and what we do when we visit nursing homes, hospitals and de-stressing events, while Karen and Piper walked around the room so that the girls could get a feel for what an actual visit at a nursing home or hospital might look like. They showed how the handler is in control the whole time and they even demonstrated the “leave it” command. 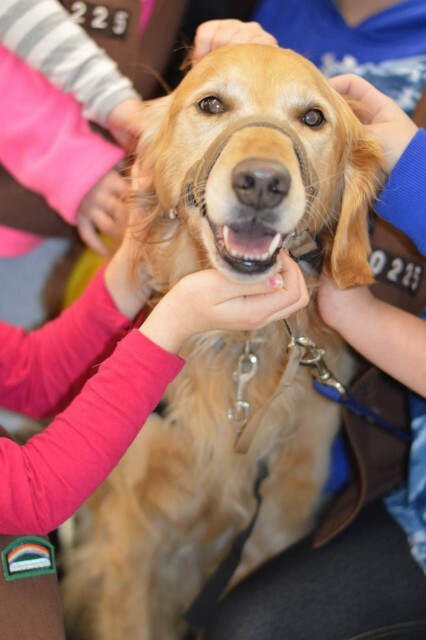 One of the leaders had a 5 year old daughter there who was afraid of dogs, and she was surprised when she wanted to stand next to Piper and keep petting her. She said that just seeing how gentle and lovable Piper is helped her become more comfortable. The girls were very attentive and asked lots of questions, including how old you need to be to be a PAWS volunteer. We might have some future members of PAWS of CNY when these girls get old enough!